Banshee, the images from Guyana are absolutely incredible- thanks! I rank them among the most amazing aircraft images I have ever seen. Note the photo of the airborne Jet Ranger, with the flag insignia on the tail- first I have ever seen of that. And note the Skyvan coded 8R-GRR in the background of the photo of the light helicopter (does anybody know the type? )- it appears to have the black-yellow-black roundel on the bottom of its wing! That is the first example I have ever seen. Thanks again! ...And note the Skyvan coded 8R-GRR in the background of the photo of the light helicopter (does anybody know the type? )- it appears to have the black-yellow-black roundel on the bottom of its wing! That is the first example I have ever seen. Thanks again! those skyvan shots really made my day...!!!!! THANK YOU VERY MUCH BANSHEE...!!!! btw, in that pic; what appears to be a roundel its the place where the support strut joins the wing with the oval cover removed... I guess the yellow shade in oval shape is the zinc chromate paint..
Last edited by the_baphomet_00; 10th January 2009, 16:46. The first photo of Skyvan 8R-GGK is from Virtual Tourist, at http://members.virtualtourist.com/m/p/m/33d56f/. This is the same Skyvan that's in the third and fourth images Banshee posted, but with a shield of some sort on the fin. Can anybody identify it? Thanks. Last edited by gkozak; 11th September 2010, 15:05. Thanks for the clarification on the roundel, or lack thereof. Goes to show you how the eyes see what they want to at times, instead of what is really there! And the videos are wonderful. Now, if anybody's got images of Mi-8s or Do-228s from Bhutan, I'll die a happy man! I have enjoyed these small air forces threads so much. I am astounded at what I have learned through them, and am amazed at the number of fantastic images I have amassed. I'll be building models well into my next life because of you all! Thanks sincerely to everybody who has contributed, and continues to do so! You beat me to it! It is indeed the Guyana Defence Force badge. I have an image I was just about to post! Thanks. Hi Folks, I got permission to post these from the guy who took them. 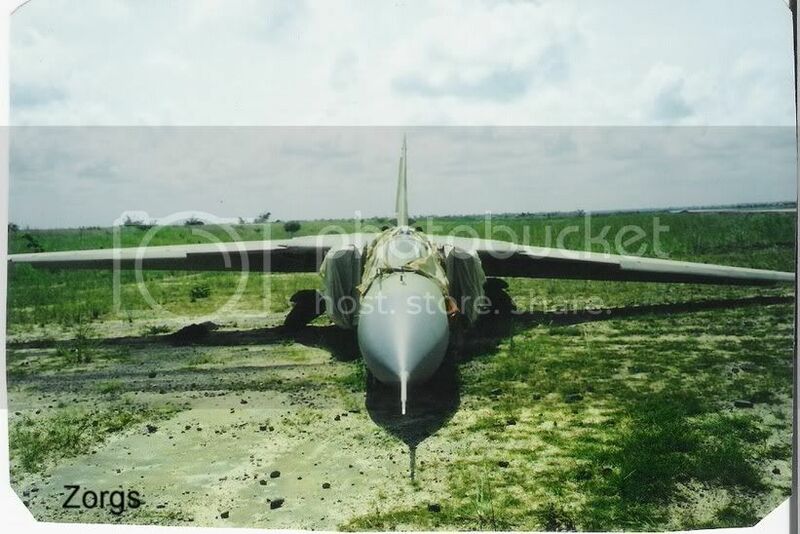 Angolan Air Force Mig-23ML operated by Executive Outcomes and flown by ex South African Air Force Mirage pilots on ground attack missions against UNITA in the Mid 1990's. I think it was July 94, while returning from a strike, this aircraft developed an engine problem. He glided 25nm to a sucessful wheelsup landing. The wheels would not extend fully without hydraulics and the aircraft suffered minimal damage..until.. the Angolans shifted it off the runway sideways with a tank rather than recover it to a hangar!! 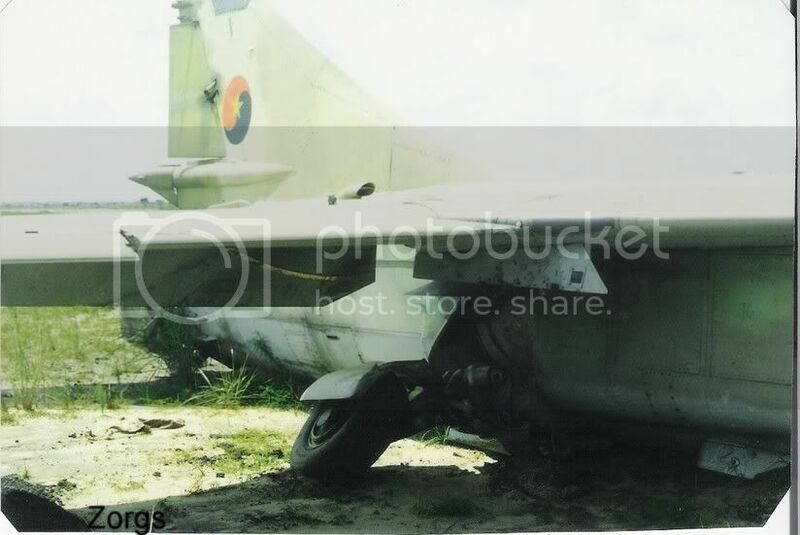 Anyone got any more pics of the Angolan Mig-23s? And note the Skyvan coded 8R-GRR in the background of the photo of the light helicopter (does anybody know the type? )- it appears to have the black-yellow-black roundel on the bottom of its wing! Some Pictures of an Mi-8Hip in Irish markings.2 were leased to provide transport for the Irish Battalion in Chad, operating as part of eufor.Taken from another forum. No details of when and where, but the Roundel may be East German or Ukraine. Camo and serial look Angolan. Yes, it is an East German MiG-21M !! They flow from July 1969 to 10.01.1974 for the JG-9 with Location Peenemünde.